Hills Science Plan Adult Light Small & Miniature has specially formulated crunchy kibbles to support oral health and premium nutrition to give your little dog healthy skin and a soft, shiny coat. All with a great taste your small or miniature dog will love! Clinically proven antioxidants to support immunity for a healthy long life. Crunchy kibbles formulated with antioxidants to support the oral health of small breed dogs. Premium nutrition for healthy skin and a soft, shiny coat. Precisely balanced, easy-to-digest nutrition. Ingredients: Chicken: Chicken (33%) and turkey meal (total poultry 50%), maize, wheat, brewers' rice, animal fat, digest, soybean oil, minerals, flaxseed, dried tomato pomace, dried citrus pulp, dried grape pomace, spinach powder, vitamins, trace elements, taurine and beta-carotene. With a natural antioxidant (mixed tocopherols). Recommended for: Small and miniature adult dogs that are moderately active, from 1 year old until 6 years old. Balance, easy to digest nutrition specially tailored for small breeds. 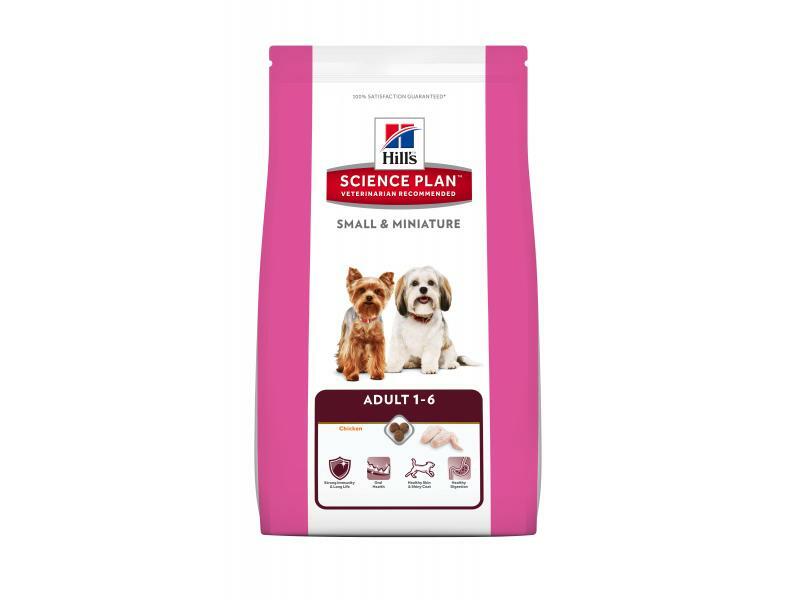 There are currently no questions for Hills Science Plan Adult Small & Miniature Dog Food - be the first to ask one!